Prior to the latter half of the nineteenth century, and dating back to ancient times in China, India, and Europe, it was widely accepted that such infectious diseases as cholera and the Black Death were caused by “bad air” or miasma. Infections were thought to be spread by contact with poisonous vapors filled with decomposed or rotting matter. The “germ theory of disease” may be the most important contribution of microbiology to modern medical science and practice, and it has served as the basis for the use of antibiotics for the treatment of infectious diseases. The concept that microbes were the cause of some diseases evolved over several hundred years, with multiple scientists providing evidence that culminated in the theory and its acceptance by the medical and scientific community. Using a simple microscope, microbes were first seen and described in the 1670s by the Dutch lens maker Antonie van Leeuwenhoek. Almost two centuries later, in 1862, Louis Pasteur conducted decisive experiments that refuted another long-held theory—namely, spontaneous generation—that living organisms could arise from nonliving matter. Pasteur demonstrated that microbes were present in the air but were not created by air. Robert Koch transformed from a simple practicing German physician to one of the pioneer founders of microbiology (as was Pasteur) after he received a late-twenties birthday gift of a microscope from his wife. From 1876 to 1883, he discovered the bacterial causes of anthrax, tuberculosis, and cholera, and devised methods for isolating pure cultures of disease-causing microbes. In 1890, he devised rules that are still used (with some modification) to determine whether a given microbe causes a disease. These postulates state that: (a) the microbe must be present in every case of the disease; (b) the microbe must be isolated and grown in pure culture; (c) the disease must be produced when the microbe is administered to a healthy individual; and (d) the microbe must then be reisolated from the individual. Koch was awarded the 1905 Nobel Prize for his work on tuberculosis, a disease that was responsible for one of every seven deaths in the mid-nineteenth century. SEE ALSO: Scientific Method (1620), Refuting Spontaneous Generation (1668), Leeuwenhoek’s Microscopic World (1674), Miasma Theory (1717), Gram Stain (1884), Endotoxins (1892), Antibiotics (1928). 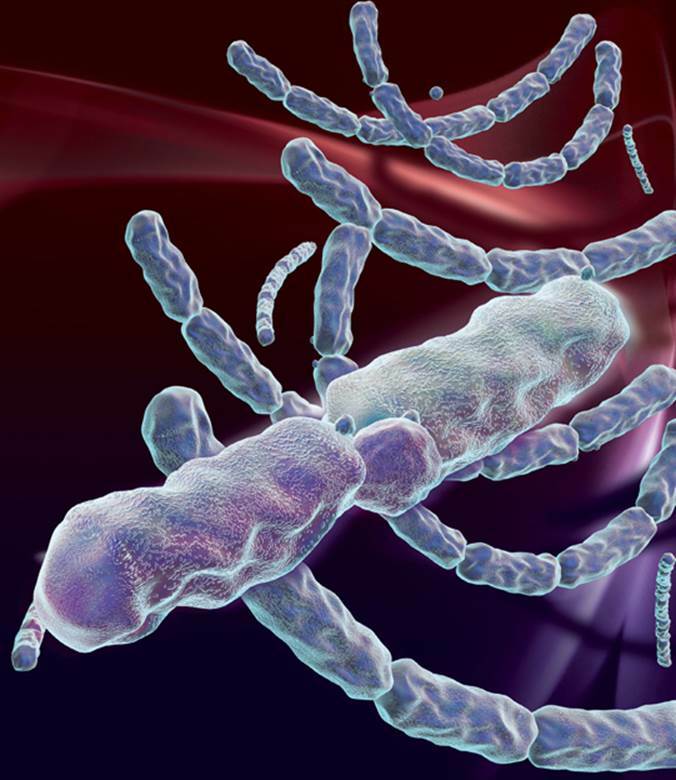 When developing his germ theory of disease, Koch used Bacillus anthracis (shown in this digital illustration), employing purified cultures of the microbe that had been isolated from anthrax-diseased animals.